Once Eric Wagner Got the Color Right, He Led the Team that Wears it to Centennial Conference success. HEAD SOCCER COACH ERIC WAGNER, relaxed and smiling, appears right at home in his cozy Field House office, surrounded by family photos and lots of soccer memorabilia, including a Manchester City banner and a giant poster of former Bayern München star Franz Beckenbauer. 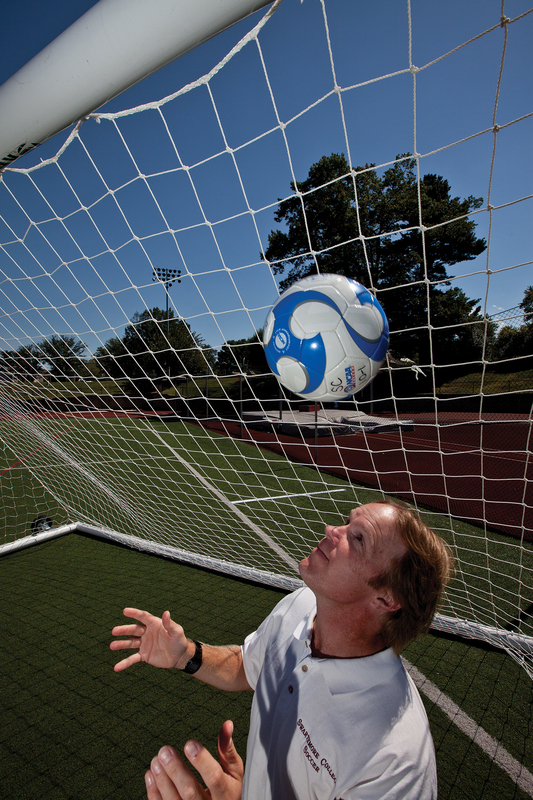 When Wagner arrived at Swarthmore in 2002, his new team had just come off a season in which they conceded 41 goals in 19 games—an average of more than two goals a game. Three years later, employing what he calls a “hard-nosed, disciplined style of defending”—which has since become the hallmark of Wagner’s program—the team reduced goals-against total to 17 in 19 games. Increasingly competitive from season to season, the team won the Centennial Conference Championship for the first time ever in 2008 and, with it, an automatic bid to the NCAA Tournament, a feat it repeated in 2009—for only the fourth and fifth times in the program’s long history, and the first time since 1991. Before coming to Swarthmore, Wagner, a four-year varsity player for Connecticut College, served as assistant coach for his alma mater, then also for Wheaton College, Duke University, and the University of Notre Dame. He was head varsity coach at Southwestern University in Texas, where he implemented a brand-new soccer program; and St. Mary’s College in Maryland, where he was the team’s all-time leader in victories. In Wagner’s 21 years of coaching at the college level, he has earned a reputation for turning losing teams around. Yet Wagner is much more than a coach. He has enlisted his team members to participate in fundraisers for victims of famine and genocide in Africa and of the devastating 2010 earthquake in Haiti. In 2008, he took the team to South America to play soccer but also to help renovate a day care center for abused and underprivileged children. Locally, Wagner organizes soccer clinics for eager young players. And, a vehement supporter of environmental activism, he’s a member of the College’s Sustainability Committee. Wagner is also a devoted family man, who loves to travel with his wife, Leslee, and two sons, Camden, 13, and Nicholas, 11, to his family’s cabin in the Maine woods and to visit his wife’s family in the Boston area. Two of Wagner’s three sisters attended Swarthmore: Lise ’85 and Karin ’90. He says he still gets choked up as he recalls a surprise visit from Karin, who drove 10 hours with their father—a Haverford alumnus—from Maine to Swarthmore to watch the Garnet play in the third round of the 2008 NCAA Tournament. Shortly after being appointed—at a time when he still had much to learn about Swarthmore culture—Wagner was showing off his new College shirt to Lise. “This is the first time in my life as a player or a coach that I’ve ever worn red,” he told her, to which she retorted, “It’s not red, Eric—it’s garnet!” saving him from a potential future blooper. Eight years later, Wagner knows his team’s color well. And thanks to him, it’s now a color to be reckoned with. You’ve been here eight years now. As they say, time flies when you’re having fun. The team is having a blast. I’m involved with the local youth soccer community as well as NCAA and conference committees. And the national recruiting base here is a challenge and a joy. I love recruiting from everywhere, rather than regionally, which was the case at St. Mary’s. What’s so appealing about Swarthmore soccer players? Swarthmore athletes are by nature more intellectually engaged with their sports than any athletes I’ve ever worked with. If I explain a new concept to them, no matter how simple, they challenge me with questions and alternatives, so I have to be really well prepared when I present it, to ensure that they buy into it. Once they do, they’re 100 percent committed. And that’s what’s exciting. Why involve your team in service as well as sport? We want to show that we play a game that has a greater good than wins, losses, and success on the field. 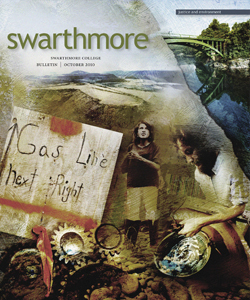 Swarthmore students are pretty service-minded anyway, and they’re healthy, strong, energetic athletes who can do lots of good. I’ve tried to tap into their interests and needs and go from there. Often there are personal connections in what we do. Our Genocide Intervention Program started as a fundraiser for victims of the Ethiopian famine. We had an Ethiopian player on the team, so I could talk to him about that. This year, the team wanted to do something for Haiti, and we have a Haitian player. This brings us closer to our causes. How do you turn around an unsuccessful team? Hard work, discipline, commitment, and recruiting. It sounds simple, and it is. There’s no magic involved. Hard work is the underlying factor, because all the other ingredients require it—from the players, the assistant coaches, and me. Garnet soccer has a long history, our alumni are extremely important resources. Talking to the guys who led the team to the national championship semifinals in 1974 has been incredibly useful. If you could coach any soccer team in the world, which would you choose? Manchester City, U.K. That was the first professional team I grew attached to, back in 1990, when I visited a friend who has been a City supporter since childhood and actually coached the team—he even has a “City” tattoo on his arm. Coaching them would be fun, but the pressure of a professional team isn’t something I’d want long term. Who’s your favorite soccer player? My favorite of all time is Pelé—his whole approach to the game and to life in general. But my soccer hero is Franz Beckenbauer. I play ice hockey on a men’s league team at Ice Works in Aston, Pa., and I play tennis for fun. For a while, I played a lot of baseball and coached at the college level. Did you ever consider another profession besides coaching? Right out of college, I thought I wanted to be a teacher and a coach, but the classroom was a little too confining for me. I needed to be outside. If I were unable to coach any more, I might consider earning a degree in environmental studies and becoming an environmental coordinator somewhere. I’m pretty passionate about that. But I just love to coach. I can’t imagine doing anything else. How about other leisure activities? My family and I love going to live music concerts, especially WXPN’s World Cafe Live. We also really enjoy camping—every year on my aunt’s goat farm in West Virginia, and, since the 1970s, at our summer cabin in Maine. To make sure that I leave the Earth better than I found it—not only the physical environment but also the spiritual and social environments as well. Following a Native American tradition, I try to consider seven generations, from that of my parents on down. I believe that with soccer I’m able to influence people in my and my children’s generations, and I hope that they’ll pass that down. Follow men’s soccer and all other Swarthmore teams with streaming media of key games.